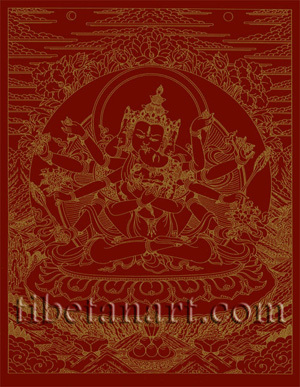 Open edition of signed and numbered gold on red Samayavajra screen prints available in A3 size (16 x 12.5 inches). Samayavajra (Tib. Damtsig Dorje), the 'commitment vajra', is a yidam deity whose practice is essentially employed in the Gelugpa tradition as a method for purification, and more specifically to restore broken vows or pledges of commitment on the Vajrayana path. This practice is performed as one of the four auxiliary components of the Lam Rim Ngondro, or 'preliminary practices on the graduated path to liberation', with the other three being the offering of water bowls, the molding of small clay deity images (tsa-tsa), and the burning of black sesame seeds within a small bronze statue of a wrathful deity known as Vajradaka (Tib. Dorje Khadro). The purification practice of Damtsig Dorje is similar to that of Vajrasattva, in that it involves his visualization and 100,000 recitations of his mantra: OM AH PRAJNA DHRIK HA HUM. The sadhana of Damtsig Dorje describes him arising from the syllable HA that seals the handle of a wisdom-sword that stands upon a moon disc and a lotus, which then transforms into the deity and his consort. The wisdoms of the Five Buddha Families are visualized as nectars in this practice, which pour into the aperture on the crown of the practitioner's head. One's body is thus filled with great bliss, and all defilements and the transgressions of broken commitments are visualized as leaving through the lower apertures and the pores of the skins as a noxious black liquid. Damtsig Dorje sits in vajra-posture upon a white moon disc and a multicoloured lotus. He is green in colour, with three faces and six arms, and he is endowed with the thirty-two major and eighty minor marks. His three faces are green (centre), black (right) and white (left); each face has a compassionate expression and three bow-shaped eyes. He wears the five divine silk garments and eight jewel ornaments of a sambhogakaya deity, and he is crowned with the small image of blue Akshobhya Buddha. With his two principal arms he embraces his consort, with his hands crossed in the humkara-mudra of 'sounding the syllable HUM'. His second right hand holds a golden five-pointed vajra, and his third right hand holds a sword. His second left hand holds a bell, and his third left hand holds an eight-petal lotus. His consort is light green and similar in appearance to him, with six arms and three triple-eyed faces that are coloured green (centre), black (right) and white (left). In sexual union she sits upon his lap in lotus-posture, with her two legs wrapped around his waist, and her two principal arms embracing his neck. With her other two extended right hands she holds a vajra and a sword, and with her other two left hands a bell and a lotus. She is adorned in divine silks and jewel ornaments, and she is crowned with the small image of green Amoghasiddhi Buddha.